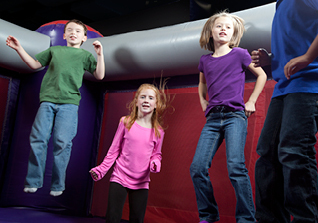 The kids have worked hard all day in school... reward them with an afternoon of After School at BounceU. This session includes 1 hour and 30 minutes of non stop bouncing in our two giant bounce stadiums. Only $13.95 per bouncer. Parents are FREE. $5.95 for non bouncers. Non Bouncers must be accompanied by full paying bouncer. 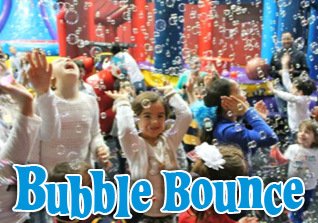 Please join us for this special bounce that starts off with a full 1 hour in our two giant bounce stadiums, followed by 30 minutes in the party room for Balloon games and/or balloon decorating to take home. Only $14.95 per Bouncer. Parents are FREE. $5.95 for non bouncers. Non Bouncers must be accompanied by full paying bouncer. Reservations required. 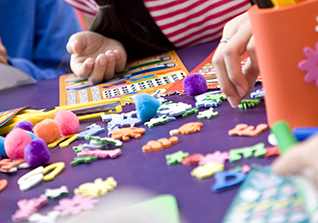 A special Activity bounce that features a full 1 hour in our two giant bounce stadiums providing non stop bouncing, followed BY 30 minutes where all kids will make their own bead, necklace, bracelet or melted bead, masterpiece to take home. Only $14.95 per bouncer. Parents are FREE. $5.95 for non bouncers. Non Bouncers must be accompanied by full paying bouncer. Are you a Bingo Master? Join us for this activity bounce that starts with 1 hour in our two giant bounce stadiums for non stop bounce fun, followed by 30 minutes in the party room for a few rounds of the popular BINGO game. Only $12.95 per bouncer. Parents are FREE. $5.95 for non bouncers. Non Bouncers must be accompanied by full paying bouncer. Reservations required. Wanna make a kid smile and giggle? hand them bubbles to play with. This open bounce session starts off with a fun filled 1 hour romp through the two giant bounce stadiums followed by 30 minutes in the party room for a bubbly good time playing. Only $14.95 per bouncer. Parents are FREE. $5.95 for non bouncers. Non Bouncers must be accompanied by full paying bouncer. 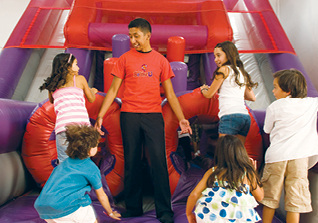 A special activity bounce that starts with a fun filled 1 hour in our two giant bounce stadiums, followed by 30 minutes in the party room where all kids will enjoy making a craft project to take home. Only $15.95 per child. Parents are FREE. $5.95 for non bouncers. Non Bouncers must be accompanied by full paying bouncer. Reservations required. Who doesn’t love to dance! 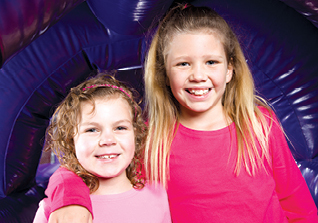 This special open bounce features 1 hour in our two giant bounce stadiums followed by a 30 minute dance party in our Party room with special effect lighting, age appropriate music and a great fun time for all. 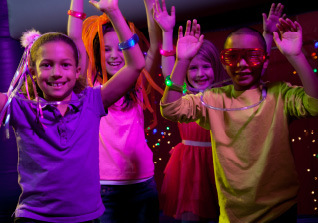 Parents are welcome to dust off their favorite moves as well on the dance floor! Only $13.95 per bouncer. Parents are FREE. $5.95 for non bouncers. Non Bouncers must be accompanied by full paying bouncer. Reservations required. This session combines the fun of spending 1 hour in our two giant bounce stadiums for non stop bouncing, followed by 30 minutes in the party room where our staff will organize fun educationally oriented games for all kids. Topics changed constantly. Only $14.95 per bouncer. Parents are FREE $5.95 for non bouncers. Non Bouncers must be accompanied by full paying bouncer. Round and round it goes, where it stops nobody knows, but you're sure to save money at this special Open bounce featuring our "Prize Wheel" entrance. Spin the wheel to determine your discount for admission for all kids you're bringing with you. There's even a chance you'll land on FREE. Everyone is guaranteed a discount. parents are FREE. Reservations required. A fun filled exhilarating hour in our two giant bounce stadiums followed by a sweet finish. 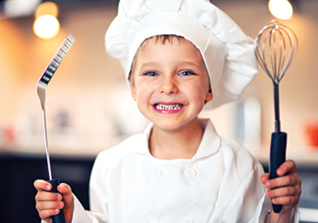 After bouncing all kids will enjoy time in our party room where they will help to make, and then decorate their own Doughnuts. We've even reserved one for mom or dad. Only $14.95 per bouncer. Parents are FREE. $5.95 for non bouncers. Non Bouncers must be accompanied by full paying bouncer. Reservations required. I scream, you scream, we all scream for Ice Cream.... Join us for this fun filled bounce featuring 1 hour in the two giant bounce stadiums followed by time in the party room where all kids will enjoy a refreshing ice cream treat. Only $14.95 per bouncer. Parents are FREE. $5.95 for non bouncers. Non Bouncers must be accompanied by full paying bouncer. Reservations required. A 1 hr and 30 minute session that starts off with a full 1 hour in the two giant bounce stadiums, followed by 30 minutes in the party room where all kids will enjoy the Kids meal of their choice.Options include; Pizza, Chick. 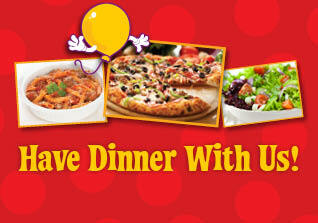 fingers & Fries, Penne W/butter, Penne W/Red Sauce, Penne W/Meatball. and Juice or water. Only $15.95 per child. Parents are FREE. $5.95 for non bouncers. Non Bouncers must be accompanied by full paying bouncer. Reservations required. This Brick Building bounce is sure to please all Lego enthusiasts. After spending a full 1 hour in our two giant bounce stadiums, all kids enjoy 30 minutes in the party room building their own "lego style" creations. Only $12.95 per bouncer. Parents are FREE. $5.95 for non bouncers. Non Bouncers must be accompanied by full paying bouncer. Reservations required. Join us for this 90 minute bounce that starts off with a full 1 hour in the two giant bounce stadiums followed by 30 minutes in the party room where all kids will enjoy pizza and juice/water. Only $14.95 per bouncer. Parents are FREE. 90 minutes of non stop fun. This session starts off with a full 1 hour in our two giant bounce stadiums followed by 30 minutes for kids to explore, manipulate and just have a great time creating their own masterpieces with Play Dough. Only $12.95 per Bouncer. Parents are FREE. $5.95 for non bouncers. Non Bouncers must be accompanied by full paying bouncer. Reservations required. 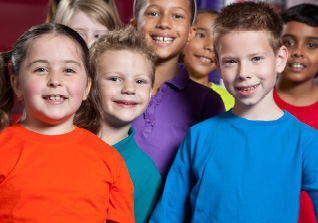 Research shows that kids who have books read to them more often, excel in school, later on.... Join us for this special bounce that starts with 1 hour in our two giant bounce stadiums, followed by 30 minutes in our party room for snacks/juice and quiet time while our staff member entertains all kids by reading a popular story. Next up..... Nap Time! Only $12.95 per bouncer. Parents are FREE. $5.95 for non bouncers. Non Bouncers must be accompanied by full paying bouncer. Reservations required. 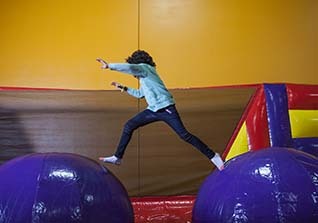 A very special open bounce that brings out the fashion designer in all of us. This session starts with 1 hour in the two giant bounce stadiums followed by 30 minutes in the party room where all kids will make their own Tye Dye masterpiece to take home. Only $16.95 per bouncer. Parents are FREE. It may seem like a carnival, but it's just the way we roll here at BounceU with this fun filled bounce featuring 1 hour in the two giant bounce stadiums followed by 30 minutes in the party room where all kids will have an opportunity to fill and take home, One-of-a-kind, multi colored sand bottle (art) masterpieces. Only $16.95 per child. Parents are FREE. $5.95 for non bouncers. Non Bouncers must be accompanied by full paying bouncer. Reservations required. 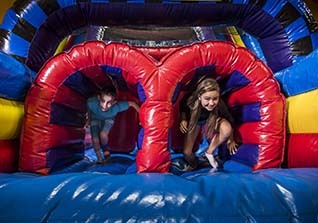 A new Open bounce that adds the fun of a scavenger hunt, to the already jaw dropping fun of our giant inflatables rides. 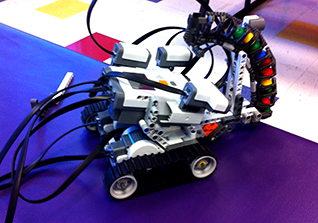 Kids can split into teams or work together with parents, depending on # of participants in attendance. Only $12.95 per bouncer. Parents are FREE. $5.95 for non bouncers. Non Bouncers must be accompanied by full paying bouncer. Reservations required. An exciting new bounce that starts off with 1 hour in our two giant bounce stadiums, followed by time in the party room where all kids will create their own masterpieces to take home using our new Spin Art Machine. Let the artist come out! Only $14.95 per bouncer. Parents are FREE. $5.95 for non bouncers. Non Bouncers must be accompanied by full paying bouncer. Reservations required. Reserved for our "starting" bouncers, 6 and younger. 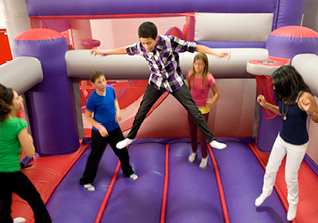 All kids enjoy a full 90 minutes of non stop bounce fun in our two giant Bounce stadiums. $13.95 per bouncer. Parents are FREE. $5.95 for non bouncers. Non Bouncers must be accompanied by full paying bouncer. Reservations are required. 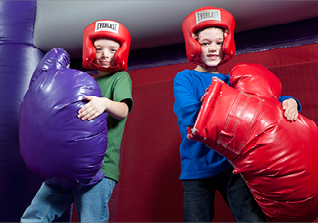 The only thing better than bouncing.... is bouncing with a friend or sibling! 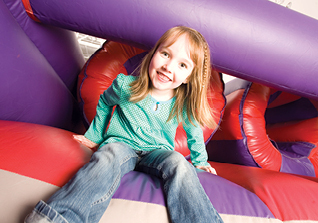 Bring along a special "someone" to this bounce and the 2nd child gets in FREE, at our 2 for Tuesday Bounce. It's 2 for the price of 1. $13.95 for first bouncer. Parents are Free. $5.95 for non bouncers. Non Bouncers must be accompanied by full paying bouncer. Reservations required. 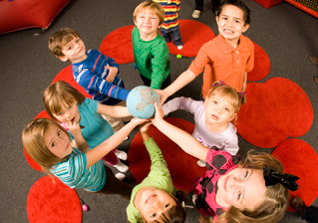 Discover Science Fun Labs is a new BounceU program designed to introduce young kids to the fun and wonder of Science. Each session starts with an exhilarating 1 hour in our giant bounce stadiums, followed by 1hr in the "lab" where all kids will enjoy creating a simple Science experiment to take home! Snacks included. A Special Open Bounce that includes 1hr in the two giant Bounce Stadiums followed by 45 minutes in the party room where all participating kids will receive FREE Pizza and soft drinks. Sorry but no vouchers or coupons allowed for this event. * Reservations are required. Times and dates are subject to change. Please check with our Events Calendar tab for the most up to date listing of this event as well as current availability. ** Parents or guardians are required to stay on the premesis. Drop offs not allowed for Open Bounce sessions. Socks required for all bouncers. This is a membership based weekly program. Call for Pricing and Insurance reimbursement details. * Receive Insurance ready receipt. *Registration is non refundable. If unable to make certain sessions, make up sessions may be provided based upon availability but not guaranteed for any particular session due to the size limitation of this program.